As you may or may not have noticed from some of my other blog posts in the past, I love food. I love it so much that I decided to start another blog devoted to giving my recommendations of the best restaurants in Palm Beach, Broward and Miami-Dade County (and maybe occasionally others when I go on vacation). On this site, which I’ve named Wine Me, Dine Me, South Florida, I have a list of some of my favorite restaurants in each county for every price range. I’ve also already got a few articles up about the following topics and I will continue to add more as I grow the site. To check out the articles, just click on the links and if this blog interests you, please like and follow it! Last Friday night Jeremy and I checked out Rebel House, a gastropub-style restaurant in Boca Raton, and really enjoyed it. The menu is creative and exciting and the environment is upbeat and fun. Located on the north side of Palmetto Park Road just south of Mizner Park, it’s definitely not your grandma’s Boca restaurant. Instead, I felt like I was at a very cool party with delicious food and drinks. The staff of tattooed hipsters played their alternative-rock music loudly, but it was still possible to have a conversation and hear each other. It’s a good spot to bring a date or get together with a group of friends. When we arrived around 9:15 p.m., the place was packed. Luckily we made a reservation for 9:30, so we didn’t have to wait too long. I strongly recommend making a reservation if you wish to go and actually get a table on a weekend night. Before I get to the food, I must first rave about the cocktails. Before being seated at our table, we went to the bar for a drink. The bartenders were slammed when we got there, but that was fine because it gave us a few minutes to go over the drink menu. I guess the bartender felt bad about keeping us waiting, because when he did greet us he poured us a sample of the Gonzo Berry, a vodka drink with muddled strawberries, lemon and simple syrup. It was tasty, but a little too sweet for me. I ordered the Sweet Revenge, a mix of vodka, fresh watermelon juice, simple syrup and some jalapeno that made it really spicy. It was so delicious that I ended up ordering another one with dinner. Jeremy tried the Rebel House’s take on the Old Fashioned- the Bee Sting, which mixes bourbon with honey, a sprig of rosemary and a hint of jalapeno. The food is just as creative and great as the drinks with the way the ingredients are cleverly mixed. Something as simple as guacamole had chunks of lump crab added to it and was served with three types of chips. The beet salad, mixed with arugula, candied pecans and grapes, came with these fried little nuggets of hot brie that oozed out of them. Drizzled over the salad, it was delicious. My personal favorite menu item was the Spinach & 4 Onion Dip. If spinach dip and French onion soup got together and had a baby, this would be it. Mixed with gruyere and parmesan cheeses, topped with a pipperade and served with garlic toast, it was absolutely delicious. The service was a bit slow, but our server was very friendly and helpful with food recommendations. As I mentioned before, the place was packed so I understand that she was busy. Before leaving, I knew that I’d want to come back for more someday, so I asked her about happy hour. The good news is that they have one on weekdays from 5 p.m. to 7 p.m., and it cuts the price of well drinks to $4. The bad news is that there’s no food included during happy hour. All in all, I really liked the Rebel House. Happy hour or not, I will definitely be back for more Sweet Revenges and to try more items off the menu. After spending my last two weekends away in Pittsburgh (one for business, one for fun), it felt good to stay local this weekend. I didn’t end up sitting on the couch and doing nothing except have a big Dexter marathon like I originally planned; instead I had a good time getting out, eating and enjoying the simple things in my native South Florida. Friday evening after work, I went to one of my favorite happy hours- a 90-minute vinyasa flow class at Yoga Fox in Delray Beach. After yoga, Jeremy and I decided to go out for dinner and I was set on trying something new. We ended up at Fish Shack in Pompano Beach, a restaurant that was recommended to us by a friend. If she had never checked in and posted an awesome review of it on Facebook, I would’ve never known the place existed. It’s a little hole in the wall, tucked away in a residential neighborhood in an old, beat-up plaza next door to a convenience store. If I hadn’t been forewarned about what it looks like on the outside, I’m not sure I would have gone in. Fish Shack may be a little sketchy on the outside, but I’m really glad we went in because the food was incredible. The menu mostly consists of local, fresh seafood dishes at extremely reasonable prices. We ordered buffalo shrimp, fried Ipswich clams and the catch of the day, a red snapper. At our server’s recommendation, we got it garlic butter-style lightly blackened. Everything was fresh and delicious, and it only came to about $46. That same meal would have easily cost $100 in downtown Delray Beach. I am now a big fan of Fish Shack and I’m looking forward to going back and trying the rest of the items on the menu. Saturday morning was the kickoff to this season’s Delray Beach Green Market, which is now held in Old School Square each week. Jeremy came home with two baskets full of fresh local produce, and we had the most incredible brunch- cinnamon buns and Caprese sandwiches of fresh bread, basil, Roma tomatoes and handcrafted burrata mozzarella. Last Saturday night was also the second Saturday of the month, which means that it was Art Walk in the Wynwood district of Miami. Each month thousands of people come to Wynwood for a night of art, food, drinks and music in the streets. The galleries and local businesses stay open later than usual, and dozens of food trucks are parked in a huge lot near NW 21st Street and NW 2nd Avenue. I personally go because I enjoy sampling lots of little snacks from the trucks (unfortunately I have yet to see more than one food truck in Delray at a time) and being inspired by all of the incredible art, both in the galleries and on the streets. The people-watching is pretty intellectually stimulating as well. Before heading to Wynwood, Jeremy and I stopped by one of my old stomping grounds, Lincoln Road. I went to “Lincoln” almost daily for the five years that I lived in South Beach and I really miss it sometimes. It felt great to visit one of my favorite book stores/ happy places in the world, Taschen, and to eat the sweet and spicy edamame from Doraku that I always seem to crave. While I don’t really miss living in Miami, I miss the little things like that. My friend Nadia, who was my first roommate in Miami, also happened to be in town for the weekend (she now lives in Orlando) and she met us at Doraku. It was nice to sip lychee martinis just like old times and catch up with her. Maybe it was the all the food I ate, or maybe it was the lychee martini (most likely the martini), but I did not want to wake up early on Sunday morning at all. I had originally wanted to so I could join and support Jeremy for part of his long run. He’s currently training for the New York City marathon, and he wakes up around 4 a.m. every Sunday to do his long run of the week along A1A. Last week he ran 20 miles! Instead I slept until 9:30, went to the gym and put the treadmill on the 5k setting. Once I got warmed up, I ran the 5k with no problem, and kept running until I had gone six miles. Not too bad for waking up feeling rough. The rest of my Sunday was spent just taking it easy. Jer and I went to visit my grandfather and have dinner with him, and then over to visit his grandmother. When we got home I finally had my Dexter marathon on the couch, went to bed early and started my week off feeling fantastic. Here’s to a great and productive week! Jeremy after running 20 miles! I just returned back to South Florida from an incredible Labor Day weekend spent exploring Seattle, Portland and the town of Dundee, Oregon (located in Willamette Valley). The northwest was the only part of the country that I had never really been and I liked it a lot more than I expected to. There’s lot of trees and beautiful scenery, fresh food and friendly, happy people everywhere. Whenever we talk about the other places we would like to live, my boyfriend Jeremy often mentions Seattle. The only thing I knew about the city before this trip was that it doesn’t have an NBA team and that it’s cold, rainy and gray for about seven months of the year. I am a Floridian who loves my sunshine and Heat, so I was a little unsure. We decided to check it out for the long weekend, which also happened to be Jeremy’s birthday. The long, deal breaking winters are a damn shame because I really fell in love. I loved the way Seattle is a colorful, diverse, big walking city without being overwhelming like NYC or Chicago. It’s the perfect sized city for me. While we were there we had six days of sunshine, and if it could be like that for a little longer than three months I could see myself living there. Portland, on the other hand, was a bit of a disappointment. The people (hippies) were nice, the farmer’s market at the university was huge and impressive and the fresh food was delicious, but the city is just sooooo damn sloooooow. Service, although pleasant, took forever and nobody seemed to be in any sort of rush to accomplish anything. We actually walked into a business hoping to get a drink early in the evening, only to be told that they were closing early because they were tired. Seriously? I know this is only one small example, but this pretty much sums up the overall vibe that I got from the people in Portland, and I need to be surrounded by a little more motivation than that. Pike’s Place Market. Probably the biggest tourist attraction in the city, but for a good reason. Fresh, local food everywhere and some of the best restaurants and happy hour deals around (we loved The Athenian). Matt’s in The Market. Our dinner spot for the first night in town. It’s on the third floor of a building facing the market, and being seated next to the huge open windows provided some of the most beautiful views of the sun setting over the water. My favorites were the Dungeness crab ceviche and guacamole and foie gras with chocolate doughnuts. Service-A, Ambiance- A, Food- B. Art of The Table. The perfect place for a date or celebration. There are only six tables and a small bar in the place, and five employees. The menu changes weekly and for $80 gets you a 10-course sampling of most of it. This is what we did, and I can honestly say that every single thing I tried was delicious. Service- A, Ambiance- A, Food- A+! Bathtub Gin & Co. A cozy little speakeasy that was not so easy to find. We were lost in an alley for almost 10 minutes before we spotted the entrance, but I’m so glad we didn’t give up. The bartender Matt’s mixology skills were one of the most impressive things I’ve ever seen. He didn’t make a single vodka and cranberry or rum and coke- everything was a carefully-mixed specialty drink, crafted with so many different types of fresh fruit, bitters and mixers. Even the way he cut fruit and crafted twists was impressive, and he had some awesome jokes. Every night Jeremy and I joked that instead of going out and exploring new places, we just wanted to go hang out with Matt again. Kerry Park. We were instructed by a local to check out this park for the most amazing view of the city. We were not disappointed with what we saw when we got to this little gem in the West Queen Anne neighborhood. Capitol Hill. The “gayborhood.” Lots of cool little restaurants, bars and shops with character. Jeremy scored a sweet new little party shirt from a vintage shop. The Escala. Ladies, the Escala is not fiction. I wonder if Mr. Grey is. Cougar Mountain. We took a nice hike about 30 minutes east of downtown Seattle. Lots of little trails and beautiful greenery! Farmer’s Market. We hit the biggest one at Portland State University. The amount of amazing fresh food was overwhelming. Just look at how many different-colored tomatoes there were! Walked around for about two hours, ate breakfast from the Verde Cocina stand and bought enough fresh food for a small feast, which we enjoyed that night. All three vineyards and wineries that we visited were at the top of the hills, so we had some of the most beautiful views. Miami Spice Kicks Off Tomorrow! Since it ended last year, I have waited 11 long months for Miami Spice to return. Restaurant owners and employees and foodies like me are so excited that the big day has almost arrived. Miami Spice, which kicks off tomorrow, August 1, is arguably the best thing that happens in the city during the long, hot summer and is a win, win for both restaurants and their customers. It gives food lovers a chance to dine at some of the city’s finest restaurants to enjoy deeply discounted, three-course, pre-fixe lunch and dinner menus for the months of August and September. In turn, it gives restaurants the opportunity to fill empty seats during their slowest months of the year and make some money. Due to the culinary celebration’s popularity and success it is now in its 11th year and continues to grow. Last year a total of more than 158,000 Miami Spice meals were served and the Greater Miami Convention & Visitors Bureau, which organizes the event, expects that number to be greater this year due to an expanded format, a still-growing list of participating restaurants, media and marketing partnerships and other special city-wide summer promotions that overlap Miami Spice. A record-breaking 166 participating restaurants are on the line-up this year, with over 50 of them being new to the list. Part of the reason for so many new restaurants is that a second, more affordable pricing option has been added to Miami Spice. In addition to some of Miami’s fanciest fine dining restaurants featuring $23 lunch menus and $39 dinner menus, there is now more casual, but still great, restaurants offering $19 lunch menus and $33 dinner menus (these prices don’t include tax and gratuities). No matter where you choose to dine, a Miami Spice meal consists of a choice of an appetizer, entrée and dessert, offering a discount of 30-60 percent off the regular value. In addition to discounted food menus, the Miami Spice website features some special offers on happy hour, wine and hotel packages. It’s a great opportunity to experience the city and try out all those restaurants that you’ve been tempted to try. Last year during Spice I checked out Red The Steakhouse, Hakkasan, Ortanique On The Mile, City Hall, Mercadito, Smith & Wollensky and Phillipe Chow. All of them are back on the list of participating restaurants this year, and with the exception of Philippe Chow I recommend them all. The reason I cannot recommend Philippe Chow has nothing to do with the Miami Spice menu specifically. I have eaten there four times and never been thrilled about anything I have tried there. Everything is overly salty and greasy, yet still blah, and even with a discounted menu I don’t find the food to be worth the price. My personal favorite was Red The Steakhouse, who switches up their menu each week in an effort to attract newcomers and reward regulars. Last year they had a week of the “classic” menu favorites, followed by a seafood, pasta and Wagyu beef week. Not all of the participating restaurants are open during the day, but Ortanique and City Hall are great lunch spots. The places that I am most excited to check out this year are Zuma, Scarpetta and newcomers Egg & Dart, The Dining Room and The Dutch. Where do you plan on eating during Miami Spice? I am all for trying to save a few bucks here and there. 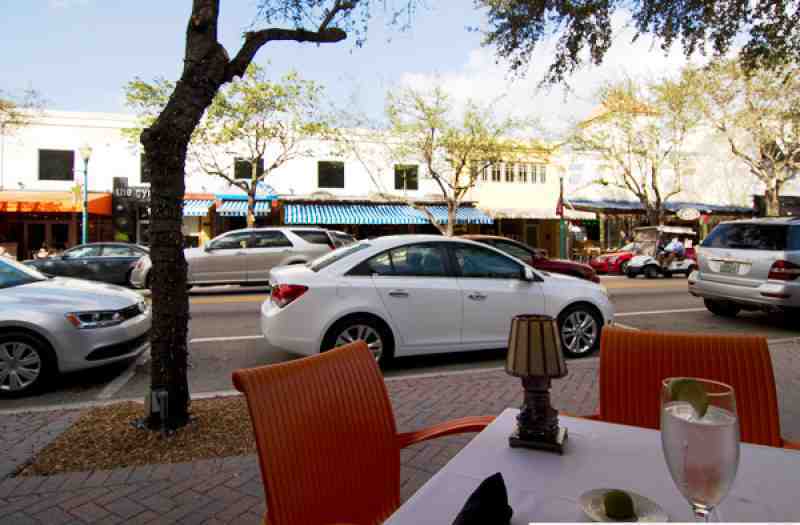 Downtown Delray Beach offers some really good restaurants, but in order to eat at a majority of them it will cost you. While I consider myself a true foodie who does not mind spending a pretty penny on a delicious meal, I also realize that it’s still possible to eat well for a better price. I’ve already shared my favorite happy hour spots in downtown Delray Beach. Now here are a few of my favorite places where it is possible for two people to fill up for $20 or less during the other hours of the day (this does not include drinks, tax and gratuity). 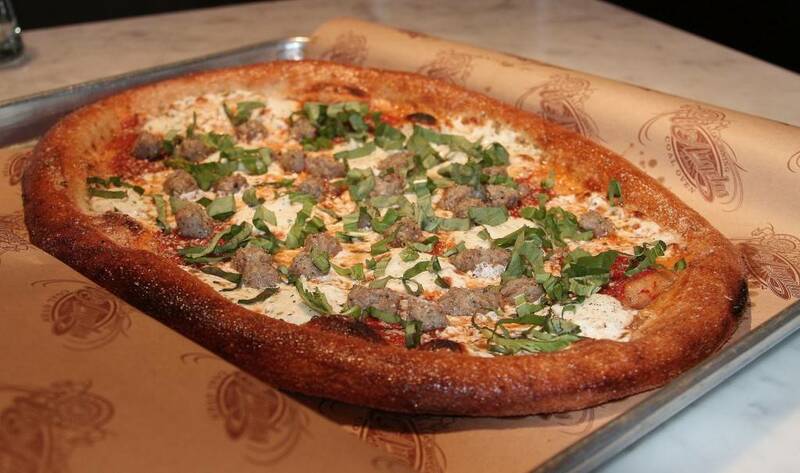 Mellow Mushroom- A medium pizza, which ranges from $17.79 to $21.49 is more than enough for two people. We always end up boxing up what we can’t finish and eating it for lunch the next day. In addition to ridiculously good pizza, Mellow Mushroom also has a great selection of hoagies and salads. Both come in half or whole size portions for about $6 or $9, which make it easy to mix and match if you choose. Senor Burrito- Everything comes in huge, sharing-sized portions here. My boyfriend and I used to order our own entrees, but there was always so much to box up. I love the salad but the leftovers turn into a soggy mess before I can finish it. Now when we go we usually order a side of guacamole ($4.50) to go with the warm tortilla chips and salsa and we split the salad with steak ($8.75) or mahi-mahi ($9.25). Jeremy is a huge fan of Senor Burrito’s homemade flan ($4.50) so we usually end with that. It’s the perfect amount of food. Granger’s Bar & Grill- This is my favorite little hole-in-the-wall spot to go for good comfort food. Granger’s has been around for a long time and has that charming old-diner feel to it. A majority of the food is homemade and it’s always served fresh and in large portions, making it another great spot to share. We usually start off with an order of the buffalo-style shrimp (they’re $9 and absolutely addicting) or some chili ($3.75 for a good-sized cup or $7.25 for a huge bowl). The entrees range from $7 to $14. My personal favorites are the grilled chicken and shrimp caesar salad and the Cajun chicken Philly. I have also heard rave reviews about the mile-high meatloaf that is served on Saturdays and the smoked BBQ ribs that are served on Wednesdays. Green Owl- The patio at The Green Owl is a great place to sit outside on the Ave. for an affordable breakfast, lunch or even dinner when it’s open late during season. Breakfast can be as cheap as $2.50 for an egg and toast or $6.25 for the “Big Breakfast,” which includes three eggs, two strips of bacon, one sausage link and a choice of home fries or grits and a hotcake or toast. The lunch plates and sandwiches cost from $4.95 to $6.95 and from the months of December- April the restaurant extends their hours to serve dinner. They have nightly specials and encourage guests to “BYOB.” The best part of that is that there’s no cork fee! Vic & Angelo’s- A dinner date here is not going to be cheap if you order from a majority of the menu, but the specialty pizzas are huge, affordable and delicious. The prices range from $14.95 to $20.95, and for about $2 each you can add on toppings including caramelized onions, meatballs, artichokes and prosciutto di parma. My personal favorites are the Mulberry Street, Grand Street and Truffle & Wild Mushrooms pizzas. 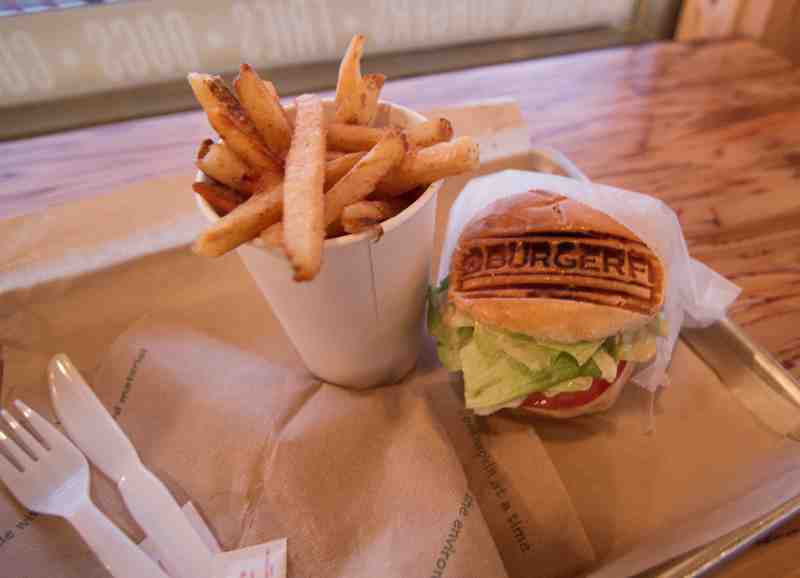 BurgerFi- All natural burgers range from $6 to $10 and a hotdog will cost you around $4. My recommendation for two people is to get two burgers or hotdogs (or one of each) and to split a large order of fries with chili and cheese ($6) or parmesan cheese and herbs ($5). Also worth mentioning is the frozen custard shakes and malts, and sundaes. They’re about $5 to $7 and are absolutely delicious.